Workshops open to everyone without any dancing skills required. The key word is to have fun and connect with your body in a very playful and laid-back atmosphere. Dancer Myriam Hervé-Gil returns to Edinburgh for a new series of workshops exploring the relationship between words and actions, in a fun and relaxed atmosphere. Divided in 2 hours workshops over 5 days, these sessions are open to everyone, whatever their physical condition. 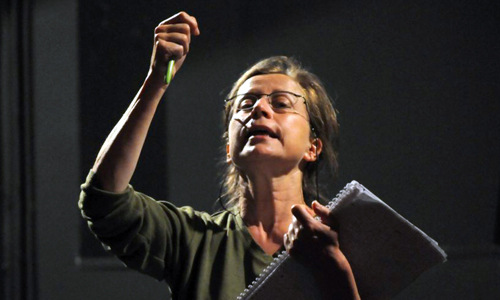 Myriam will make you explore the connections between words and body movements. This artistic concept is based on working on the basics day-to-day gestures: to bend down to pick up, to stretch out an arm to catch, to look up to look at something, to run to catch a bus, to sit down and rest, etc. The second stage of work will focus on these movements in space, adding up levels (sitting, standing, lying) and qualities such as speed, slowness, relaxation, stress, jerk, and feelings like anger, tiredness, pleasure, fear, surprise… to finally explore the theatricality aspect of movements. Être fort comme un boeuf / To be as strong as a horse. The workshops are reserved in priority to people registering for all 5 workshops, since a public presentation will be performed at the end of each week. Given the limited number of participants, we ask you to book as soon as possible.